Companies that engage with various projects at any given time require a primary application that manages them. Project management software aids to these requirements and plays a vital role throughout the process. The usage of this software increases the efficiency and productivity of the business. In the world of rapid technological change, project management tools are a boon for users that work on multiple projects. This software keeps the work under the budget, delivers on time and keeps tracks of all the scopes of projects. Usually, it comes as cloud-based, multi-user platforms, hosting features like project planning and scheduling, advanced reporting, project budgeting, etc. They are meant to ensure that project stakeholders are always informed about the advancement of the software and the project is completed with precision. There are many of this software making users more confused while purchasing. Finding the right software amongst all available becomes difficult and takes a lot of time into consideration. 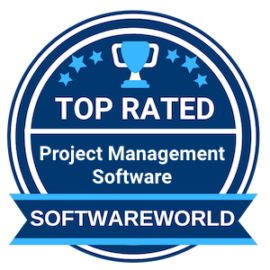 To ease the work, SoftwareWorld has assessed various of these project management software in the market and lists down the best ones in the list below. What are the Best Project Management Software in 2019? About Trello : Trello is an easy to use visual collaboration tool and an online project management system, used for planning tasks and reporting progress of projects. With the concept of boards and cards, it creates categories to track regular work progress on each project. Top features include activity log, deadline reminders, assign tasks, in-line editing, etc. From marketing to sales and support, this software works for all kinds of users. “Amazing functionality, straight up no fuss. hit the ground running with no sweat loss. Configuration is quick and easy with an easy to follow interface. If you have never used this before, not a problem, just feel your way around and you will be cooking in no time. I love it.” – Chris G.
About Wrike : A cloud-based online project management software, Wrike is one of the best available solutions in this category. It allows users to collaborate with more than multiple groups and features tools like Gantt charts, calendars, workload view for resource management, dashboards, document collaboration, etc. Businesses use it to schedule, prioritize, discuss and keep track of the projects. It is suitable for all kinds of companies ranging from finance to healthcare to marketing, etc. About JIRA : JIRA is the best online project management tool for agile teams to plan, track, report, and release project deliverables. With user satisfaction over 99%, it helps in creating, supporting, assigning and setting priorities to different works within the organization. Top features include agile methodologies, kanban board, portfolio management, Gantt charts, etc. It is ideal for large and remote teams working from different locations as it allows mobile connectivity with Android and IOS users. About Microsoft PPM : Microsoft PPM is a project management software that allows users to work remotely. It is a flexible software with all the essential features like IT management, successful product delivery, manage team schedules, plan resources, discover and share information, etc. It enables project managers to define project tasks assigned to each team and track them regularly. From meeting deadlines to choosing resources, it helps users to become more efficient and productive. “Excellent tool for managing large-scale projects. Microsoft PPM is a perfect project management software to meet the requirements of large companies, this enjoys a friendly interface with the user and it is evident that it maintains the quality standards of the applications Office.” – Esthephan C.
5. Asana – Project and work management for teams of all sizes. About Asana : A cloud-based project management software that allows teams to focus on the number of goals, projects, daily tasks and others to have more efficiency and productivity. Top features include task management, automatic notifications, customer portal, reporting, budget management, idea management, portfolio management, etc. Asana is one of the most popular tools in this category and helps in getting teams organized to work on multiple projects and serves any size of companies. About Teamwork Projects : Teamwork Projects is an online project management system that combines high-performance features and smarter workflows for teams to integrate and works upon different projects. It is one of the most popular tools and is the fastest with all the elements necessary for daily work efficiency. From providing best in class collaboration platform to inbound communication, this solution enables users to increased productivity and high performing assets of a company. About Podio : Podio is a collaboration and project management system that helps teams creates custom applications to meet unique business requirement and preferred workflow without having any prior technical skills. Top features include agile methods, cost-to-completion tracking, client portal, milestone tracking, kanban board, time and expense tracking, idea management, etc. It speeds up communication and provides complete transparency and accountability with the teams working under the number of given projects. “I use it every day to improve my business organization. It keeps tracks of my clients, important events, money, expenses, quarterly reports, and anything else. I love the customization of the apps, which allows me to create whatever I want, from CRM to tracking.” – Danny D.
About Smartsheet : One of the leading project management tools, Smartsheet serves businesses innovatively and helps in collaborating on projects and processes. It redefines how teams work on tasks such as managing operations, tracking marketing campaigns and planning events. This software offers a suite of management applications, such as document management, reporting, resource management, time tracking, issue management, etc. It is regarded highly for its online task management, file sharing, and collaboration features. About Freedcamp : Freedcamp is web-based software designed for single and multiple users to help in organizing and collaborating work. Being an ideal software for businesses that need to take control of projects, resources, budget, and time, it is a free platform for an unlimited number of users and projects. The top feature includes a client portal, agile methodologies, Gantt charts, discussion boards, etc. It is one of the best project management app for large companies. About monday.com : Monday.com is a management tool that helps users to collaborate, focus and work on many projects, streamlining contribution, and improving teams and departments perform in the best possible way. Top features include milestone tracking, agile methods, idea management, resource management, traditional methods, etc. It has an advanced scheduling system that makes it distinguished as one of the best project management software available for companies. About ProjectManager.com : Project Manager is an award-winning online project management application that offers features such as budgeting, scheduling, reporting and tracking of the ongoing projects of a company. Users can create new projects and tasks seamlessly. Companies like NASA, Volvo and many others use it for the ease of work and collaboration it provides. It integrates with MS Project and allows users to import plans and helps in customizing security settings. About Zoho Projects : Zoho Projects is one of the leading project management tools that enable businesses, large and small, to plan projects, assign tasks, communicate, etc. It aims to deliver the ultimate project management experience for its users. Top features include traditional methods, client portals, milestone tracker, time and expense tracker, customizable templates, etc. This solution enables users to reach higher potential in their work and boosts overall productivity and efficiency of companies. About ProofHub : ProofHub is best for teams who want to collaborate and communicate on projects at one place. It is a project management software that makes it very easy for managers or teams to keep a tab on who is doing what, to know how much each team member is producing, prioritize tasks, set start and due dates, define clear deadlines, and to bring clarity to work allocation by creating task lists with just one click. In order to maintain streamlined management of work, organizations look for ideal Project Management software applications. This buyer’s guide will show you how a project management software works towards the benefit of a company and how it can enhance the work management of any business effectively. It will also help you choose the right software to address your organizational needs with ease. » What is Project Management Software? » How does Project Management Software work? » What are the benefits of Project Management Software? » What are the features of Project Management Software? » How to choose the best Project Management Software? » Is it worth investing money in Project Management Software? » How Much Does Project Management Software Cost? » What are the top Project Management Software in 2019? It is a software application that enables you to effectively collaborate and monitor various projects at a time on a real-time basis. Unlike on-premises systems, the popular online cloud-based systems are in more demand. As most of the software applications offer flexible features and pricing, investing money would not be a problem. However, you have to choose the right software that will best fit your needs. The work of a Project Management Software is to plan all the essential activities of your project by facilitating a platform where you can assign a specific task to your team. Besides, its unique features help you manage your resources and promote productive collaboration with your team. The software offers you to plan a project by covering every critical detail. You can track your ongoing project and figure out any errors beforehand rather than waiting for a drastic measure. It let you appoint specific tasks to your employees as per their skills and track their progress effectively. You can prioritize tasks for your employees and send them occasional reminders about their responsibilities. You can also follow the time spend by your employees on an individual task. It offers you a myriad of possibilities to escalate your project speed. You can set the 'start date' and 'end date' of a project along with a feature to break your project into small segments. Then, you can assign responsibilities to different employees. An online project management software application lets you add sequence to your works. For example, if one job can’t be started without the completion of a previous task, then you can set sequences to your tasks. The dependency view or a Gantt Chart enables you to view the dependency between tasks and work them accordingly. The project management tool helps you build a powerful Gantt Chart provides you a clear view of an ongoing project and upcoming milestones. If you need to change your plans in between, you can add new tasks or modify an existing job. This also allows you to set dependencies and Print the Chart Diagram in physical form or export the chart in PDF form. The software provides you a feature to distinguish your projects in precision. It let you classify your tasks into milestones, task lists, completed & incomplete tasks in % view and dependencies. Gantt Chart modifies the dependencies by allowing you to add new successor, predecessors, editing existing dependencies and adjust the time lag between tasks. The Kanban board displays the completed tasks, priority of tasks and the specific section of tasks. It let you reorganize your tasks and gives you a detailed analysis regarding a failed or behind-the-schedule assignment. Using a Project management software can be the best solution for catering to the various issues involved during project handling. This allows teams or individuals to communicate with each other effectively in case of a problem. Moreover, the PMS systems also enable smooth transfer of files, documents, status updates, and more. Setting up a project management software can help in completing tasks within stipulated time without any confusion. This is because many PMS systems come with in-built intimation and scheduling compliance which allows managers or admins to specify each task to a team member with a single click. As the functions are given to the defined circle members, other members can utilize their time efficiently and without any confusion. This not only helps manage the workforce properly but also helps in reducing the add-on on expenditures, thereby saving a lot of pressure to build upon the budget of the company or business. Till today various companies and enterprises use pen and paper method for listing upon the employee as well as project details which increase the chance of risks. This is due to the heightened risks associated with the entry of the particulars when done manually. However, this issue is wholly solved as PMS software automatically uploads the data to the cloud without any human interference. Now let's have a quick look at the various features of a project management software which when used by firms and enterprises helps in increasing productivity and maximizing profits. Project Management Software provides a feasible transfer of various files and data, such as customer profiles, documents, calendars, contact lists, and more among the approved members. Hence, the PMS software plays a significant role in reducing the wastage of financial resources while simultaneously increasing productivity. As the data and the tasks are shared in an open platform among the team members, project managers or admins can set the essential functions in the top for letting other members know the task's importance. This will also help in understanding and differentiating the tasks which need to be done first. A shared team calendar can also facilitate an individual or a firm to link other calendars, such as Google Calendar, iCalendar, etc. which can aid in initiating the team members about meetings, deadlines, and assigned projects beforehand. PMS software often comes with specific time slots and time tracking feature which can allow an admin to keep a track on the total time taken by an individual to complete a given function. Moreover, it also comes with real-time availability function which can be used to assign another project to a person depending upon their vacancy. One more interesting feature of the Project Management Software is that the software also offers automatic invoice creation, forwarding and intimation in case of due invoices through emails. Furthermore, one can also check detailed reports on monthly and weekly expenditures, expenses, and totals for the effective management of the company's budget. The PMS software also acts as a central reservoir for all your documents and files, including expenses, bills, calendar events, projects particulars, upcoming and ongoing tasks, etc.. Hence, allowing retrieval and easy access of the projects from anywhere and anytime. As discussed above, Project Management systems not only allow easy access from any place at any time but also reduce the headache of scrolling through multiple spreadsheets by compiling all of them in a single location. It is for sure that you will be promised never-heard-before facilities of the software but after subscription, you may or may not be able to experience them all. It may also happen that you may end up buying the wrong software for your business which actually means to serve an industry of niche other than yours. So, it is imperative to run some pre-checks on your behalf to be able to decide which kind of online Project Management Software you want. Sorting your priorities beforehand will enable you to separate the wheat from the chaff quite easily. In this regard, here are some of the questions to which you need to find answers to be able to select the best project management software for your firm. One of the first things that you must do before choosing any project management software for your organization is to decide what kind of buyer you are. Basically, there are three types of buyers- small business buyers, departmental buyers, and industry-specific buyers. Small business buyers usually look for software having online project management tools that can handle task and schedule projects easily. For such small companies, the software must also have document sharing capabilities. If you are a small business buyer, you will definitely look for project management software for small business which can update with a project or task on a real-time basis. Most organizations prefer on-premise policy. Here, it is important to ask for upgrade policy, support policy and price of complete ownership to your vendor. On the other hand, if you are opting for an online project management system or a SaaS solution for convenience and flexibility, you need to inquire about the security and compliance factors more than anything else. Off-premise solutions bring with them questionable factors like overall time to value and automation requirements into the picture. Therefore, choose an option that promises a better return on your investment. Most of the time, buyers do not know what right questions to ask a vendor in regards to the security of an application. Well, first and foremost, you need to ask whether the vendor is ISO 27001 complaint or not. Secondly, you must ask if they meet SOC type II compliance or not. The vendor should be transparent about its test history, audit trails and full compliance reports. In case, the vendor is raising objections or feeling hesitant sharing all the above-said security essentials, it is better to give it a go. It is also important to verify the vendor profile. Run a background check on the vendor and try to look out for the flaws those may affect your business to a lot extent. For instance, if the vendor has a bad reputation in terms of customer management then you may have a tough time dealing with software bugs post installation. Some vendors have hidden charges to swell the final budget that may take you by surprise for sure. Therefore, before finalizing any vendor, it is better to take public opinion in open forums and to look for project management software reviews to remain assured of the service quality that you are going to get in the future. Your team those who will manage the project will most of the time remain outside. Therefore, it is a better option to go for software which is mobile compatible. You can log into the system, check the progress of a project or task and can get information on important data at any time. These days, project management software applications can run on an iPad iPhone or Android device. If your software through team project management tools will have social activity streams integrated to it, it will allow you to report on and share information on any project. You can instantly share expense sheets, project approval documents and other person and documents with your fellow members with ease. Therefore, always ask your vendors if their application supports such activity streams or not otherwise it is good to give it a go. There will be a time when you have to add outstanding solutions to your existing business application in order to achieve better scalability. For instance, you can add your existing account system to your project management system so that you can have a detailed report on project invoicing, billing and other financial expenses on a real-time basis. Check with your vendors and ask them whether their project management software allows such integration or not. As your entire business that will be infused into the project management software, it is imperative to ask your vendor whether the software has cutting edge security to protect the data from an unwanted security breach or not. Though you will not be restoring very sensitive information such as customer list or social security numbers still there is a chance that someone might get access to other sensitive information worth protecting. This is another important factor to consider after project management tracking tool. In today’s market of cut-throat competition, in order to remain ahead of competitors, two major factors are required – Quality Performance and Supreme Agility. In this regard, the project management software can not only help you working smart but also can speed up your process of innovation. Many kinds of research have concluded that the presence of the right PPM solution can enable organizations to boost their number of project completion by 35% and can reduce the overall project cost by 37%. Also, the rate of project failure can go down to 59%. The pay-as-you-go service platform gives you the freedom to cancel the subscription anytime you want. Many project management software is capable enough to take care of the company’s innovation cycle by aligning top-level strategies with resources. It can roadmap your strategic investment with effective collaboration both within and across teams, organizations, and regions. As it provides real-time visibility into requirement dependencies, the management gets comfortable in making agile planning. Hiring a team of experts to carry out the above-said would definitely cost you 30-40% more than the annual subscription of an ideal project management software. In this regard, the software should definitely be in the wishlist of every small and mid-sized company. Nowadays, big MNCs are also making this software application a must-have part of their technological integrations to gain a cutting-edge advantage over their market competitors. The pricing of project management software starts from as low as $3 to a whopping price of $99 per month. The subscription price of the software entirely depends upon its features and the user-friendliness of the interface. Almost all the online project management software is available with a monthly based subscription. Some software with cheap monthly subscriptions fees between $3-$10 offer limited features and charge you extra for using rest added features on per user per month basis. Some project management software applications even let you pay a small price and then add one more user without any added features. If you are a small business with limited employees, then this feature is excellent. They carry essential features of the project management tools and are ideal for small to medium scale organizations. However, if the requirement of your business is more you can choose an enterprise version of the software. Some software comes with a more significant list of additional features as well. They offer additional features with a more user-friendly interface. If a monthly subscription is too much for you, there are software application like which also offer annual subscriptions option with much better deals. However, it is always better to go for a free trial unless you are not familiar with implementing the software into real-time usage. If you are looking to adopt any new Project Management Software lately then make a list of near-term objectives which need to be addressed in order to make the investment to be a deemed success. However, make sure that the application you have zeroed on is going to address those critical near-term requirements in a holistic way. In case, you are not sure about how the application will perform, go for a free trial and if possible look for positive user reviews in order to make an easy decision. Moreover, it should provide a familiar user experience across all key modules and should not demand extensive staffs to get tailored for meeting organizational needs. If you get successful in finding such a software application that can bridge the demand of your organization, you will be in a good position to wring maximum profits out of your investment. » ITSM Software - The ITSM software handles all the activities involved in the lifecycle of the IT services in an organization. So, it takes part in the design, creation, delivery, support, and management of the different IT services. » Collaboration Software - A Collaboration Software is responsible for enabling the process of sharing, processing, and managing files, data, and various other kinds of documents among a number of users or various systems within the same organization. » Bug Tracking Software - Bug tracking software is one type of software application to track software bugs in software development projects. The best bug tracking software offers the exclusive process where you can smoothly capture the bugs and report to the developer team.